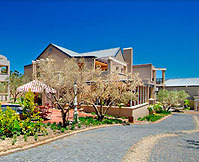 Mountain Shadows Guest House Cape Winelands South Africa is beautifully positioned on a working olive and wine farm. Sitting at the foot of the attractive Drakenstein Mountains close to Paarl this historic Cape Dutch manor house has been declared a national monument. Cape Town and Cape Town International Airport are both within easy reach and conference delegates will have a choice of activities from exploring the Cape Winelands to fly fishing or golf. Business executives and conference delegates will sample great food using only the freshest local ingredients. Combined with the fine wines from neighbouring cellars will ensure that a conference delegates stay at Mountain Shadows Guest House in the Cape Winelands is an unforgettable experience. Foreign delegates will benefit from the following languages being spoken: English, Afrikaans, German, French, Swedish and Finnish. Each room is individually decorated with exquisite interiors and antique furnishings. Blending history and culture with modern day amenities will meet the demands of the most discerning of conference delegates. The room amenities that the busy conference delegate can expect include satellite television, telephone, safe, hair dryer and fridge on request. Conference delegates and business executives will enjoy the excellent standard of cuisine at Mountain Shadows. Mouth watering dishes are created using fresh and local ingredients, accompanied by a selection of superb wines from the cellar. 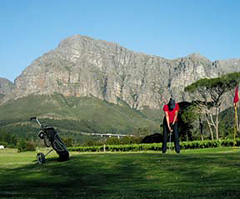 Mountain Shadows Guest House Cape Winelands South Africa offers conference delegates the chance to play golf on their very own 6 hole golf course or relax by the swimming pool or indulge in a game of lawn croquet. 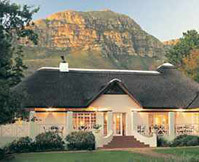 A conference held at Mountain Shadows Guest House Cape Winelands South Africa is a very private experience. Due to rural ambience and substantial grounds conference delegates can be assured of absolute privacy allowing focus on the business in hand. This conference venue can seat up to 50 conference delegates and is ideal for a number of activities from team building and corporate getaways to full conferences. 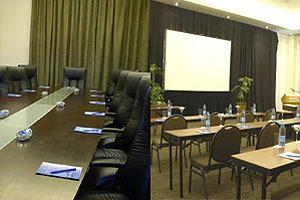 The conference venue is equipped with all the necessary conference facilities. Those clients booking in March can even participate in the traditional crushing of the grapes by foot. 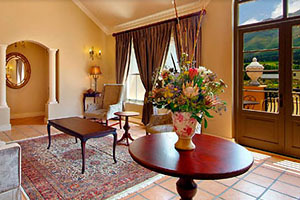 The Protea Hotel Franschhoek South Africa is set in the historic village of Franshhoek , 45 minutes from Cape Town. The hotel enjoys a rich history dating back to the French Huguenots settlers of 1860. 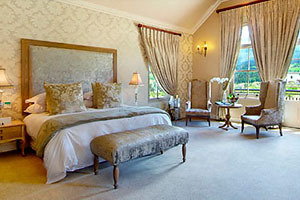 The 4 star Protea Hotel Franschhoek has beautiful mountain views and exudes peace and tranquility. 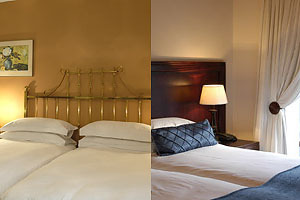 The hotel offers luxury accommodation, a renowned restaurant and excellent conference facilities. Conveniently positioned conference delegates will be able to sample the culinary delights of Franschhoek , which is one of the leading culinary and wine tasting destinations in South Africa. 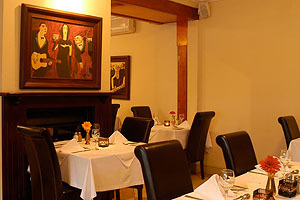 is a cosy restaurant offering an elegant dining atmosphere with a superb blend of contemporary and classical cuisine. For relaxation conference delegates can relax on the open –air terrace or take a swim in the sparkling swimming pool. 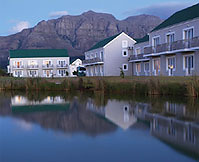 The Protea Hotel Franschhoek South Africa is an excellent conference venue with a capacity of 50 conference delegates. The hotel boasts the venues, catering services and overall infrastructure to host company’s conferences. Break-away sessions and teambuilding efforts in rooms equipped with the latest audio-visual technology are also available. 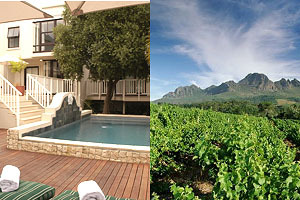 Le Quartier Français Franschhoek South Africa is an exclusive boutique hotel situated in the heart of the Franschhoek Wine Valley. Jjust 45 minutes out of Cape Town the conference delegate will experience beautiful views secluded gardens and a fairytale-like haven of tranquility. Perfectly located just off the main road, Le Quartier Français Franschhoek gives conference delegates the opportunity to wander out on to the main road of Franschhoek and immerse themselves in the local culture and ambience of this charming town. 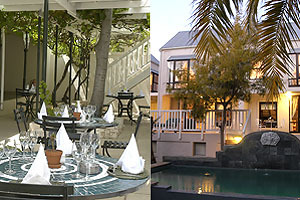 Le Quartier Français Franschhoek South Africa offers high class conference delegate accommodation. A wonderful escape. All of the 10 Auberge Rooms have been individually styled and ﬁ tted with the latest modern touches. The excellent use of colour and the spacious seating area ensure that the Auberge rooms are a simple yet lively setting. THE WOW FACTOR: The Auberge Rooms are luxurious and comfortable, with a touch of individual ﬂ air and a liberal dash of personality. Easy to fall in love with and impossible to leave . The double volume Grande Rooms make a striking trio. Oversized chairs, extra-length windows, king-sized beds, exquisite fabrics and a fabulous bathroom create a voluptuous atmosphere. Everything, from their bed size to their window length, adds to their sumptuous appearance. FEATURING: iPod docking stations, oversized furniture and complimentary refreshment trays. THE WOW FACTOR: The Grande Rooms are ideal for couples on honeymoon or anyone likely to spend more time in their room than out. They’ll make any heart sing. The two Petite Garden Suites look out onto their own secret corner garden. Large sliding doors spill open onto a private patio that looks over the gently crafted area. The Petite Garden Suites, with their indoor and outdoor sitting areas, fashion a relaxing setting for guests; a place where it’s perfectly acceptable to indulge in a delicious afternoon nap. FEATURING: iPod docking stations, a private patio, a writing desk, Nespresso machine, complimentary Sherry and eclectic art. THE WOW FACTOR: The best Cape Winelands afternoon-nap location. Your own secluded piece of Le Quartier Français. Unwind with space, delight in the privacy of a secluded pool. The two elegantly decorated and appointed Auberge suites each feature a private walled garden, a pool, a loft section for children, a Wii gaming consul, a Nespresso machine, a complimentary full bar and an iPod docking station. THE WOW FACTOR: A private pool in a private walled garden … how romantic! “I feel like Alice in a more than beautiful Wonderland” Four richly decorated and generously sized suites (two upstairs and two downstairs) set around a private central courtyard and pool. The Four Quarters Suites combine the utmost in luxury with sophistication, charm, all modern ﬁ ttings (including a walk-in dressing room), two large dual-view ﬂ at screen TVs, complimentary full bar and impeccable service in the form of a private full-time butler. THE WOW FACTOR: Once you’ve experienced the joys of a private butler it’s hard to imagine life without one. Experience Franschhoek from a local’s perspective. This charming cottage – located across the road from the main hotel – offers comfortable accommodation for the whole family. Featuring two bedrooms with en-suite bathrooms, a fully equipped kitchen, laundry room and two spacious lounge areas opening onto a private pool. THE WOW FACTOR: the Cottage allows guests to immerse themselves in the Franschhoek experience. Delightful! Conference delegates and business executives can enjoy fine dining and a complete gastronomic journey can be experienced at Le Quartier Français.Franschhoek. Sticky buns for breakfast, bistro lunches on the terrace and a dinner of award-winning cutting edge cuisine – by Relais & Châteaux Grane Chef Margot Janse (and her team) – in the world renowned Tasting Room. For more hands-on culinary adventures join the in-house Culinary Concierge. Mornings packed full of bread baking, cooking with South African ingredients, dessert discoveries and wine blending are just a taste of the experiences on offer. The Treatment Room menu, as well as The Screening Room and eclectic Shop, Touches &Tastes, all add a dash of unforgettable charm to the Le Quartier Français Franschhoek South African conference experience. It is the extraordinary staff, the opulently comfortable rooms and the attention to detail that ensures that this Relais & Châteaux Auberge is the ultimate spoiling. The Conference venues at Le Quartier Francais Franschhoek are found in the 4 Quarters Lounge that has a capacity of 10 business executives or conference delegates and the Movie Room which has a conference delegate capacity of 30 in cinema style. The five star L’Ermitage Chateau & Villas Franschhoek South Africa lies in the exclusive village of L’Ermitage and within the secure grounds of the prestigious Frans Hoek Estate. 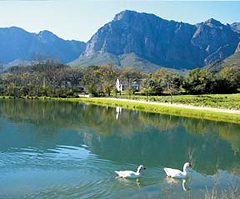 L’Ermitage is only a short walk from Franschhoek village and all this picturesque town has to offer. With a history dating back some 300 years to the French Huguenots settlers, this most enchanting of conference venues combines history charm and service with superior modern amenities and fine dining, all with wonderful mountain backdrop. Whether the conference delegate or business executive decide to cocoon themselves in luxurious in-door comfort, or stroll the sunny vineyards, their L’ermitage experience will be utterly memorable. The Chateau offers high class conference delegate accommodation with six superior bedrooms (1 suite & 5 bedrooms). Each of these rooms are luxuriously furnished and will delight the weary conference delegate with breathtaking views of the Franschhoek Mountain range. All of the rooms are air conditioned, have comfortable King size beds and separate baths and showers. 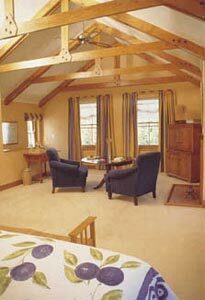 Some of the rooms at L’Ermitage Chateau & Villas Franschhoek also enjoy private balconies. The cobbled streets of at L’Ermitage Franschhoek South Africa are lined with beautiful Villas enjoying the stunning back drop that the Franschhoek Mountain range affords. The thirty six villas are offered to conference delegates with the following choices of 17 one bedroom, 17 two bedroom and 2 three bedroom villas. The villas are luxuriously furnished, spacious and well appointed with a fully equipped kitchen. 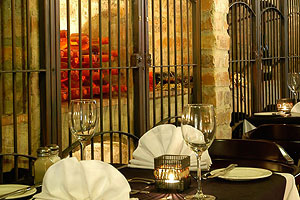 Conference delegates and business executives can enjoy fine dining at the L’Ermitage Village Restaurant. Gourmet dishes are both inventive and fresh designed to enhance the conference delegate alfresco experience or an intimate indoor ambiance within a Provencal-style setting. The Conference venue at L’Ermitage Chateau & Villas Franschhoek South Africa lends itself to smaller conferences of 60 conference delegates or less. This conference venue provides state of the art audiovisual equipment and benefits from experienced, friendly and professional staff. This will ensure a seamless execution of the conference or business function allowing for conference delegates to concentrate on the business of the day. 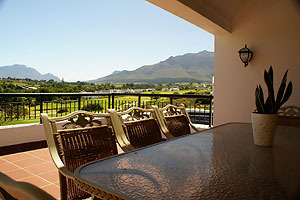 The Winelands Golf Lodge De Zalze Stellenbosch South Africa derives its name from the original wine producing farms in the area, Groot Zalaze, Kleine Zalaze and De Viele. With historical buildings dating back to 1838, lavish lodges and excellent scenery, this is a conference venue that can be used in conjunction with recreational pleasure of the superb 18 hole golf course. Positioned 3 kilometers from South Africa’s second oldest town of Stellenbosch and 45 minutes from Cape Town, The Winelands Golf Lodge De Zalze Stellenbosch South Africa is an excellent conference facility for small numbers. Conference delegates staying at the De Zalze Winelands Golf Estate Stellenbosch South Africa will enjoy the lodge complex designed sensitively to complement the traditional Cape-style architecture. Sited in close proximity to the golf course the conference delegate can easily combine work with pleasure. 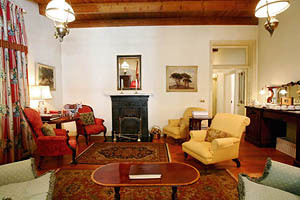 The accommodation is in the form of one two three or four bedroom lodges all spacious and beautifully furnished. Conference delegates or business executives have been provided with separate bathrooms in every category of lodge, so sharing of bathrooms even in the 4 bedroom lodges is not necessary. Air conditioning is standard and the facilities are what a conference delegate may expect of such a fine establishment. Conference delegates and business executives are offered a unique hospitality concept. Combining all the comforts of a hotel, whilst enjoying the freedom of a self catering resort, allows for different dining experiences. The conference facilities at the Winelands Golf Lodge De Zalze Stellenbosch are ideal for min-conferences or business meetings or for corporate stays. The conference venue in the Hospitality Club House can accommodate 15 conference delegates and further business services are offered including faxing, copying and wireless internet vouchers. The Protea Hotel Dorpshuis & Spa Stellenbosch South Africa is elegant Victorian Boutique Hotel offering a fusion of Victorian and modern elegance in the heart of the Cape Winelands. 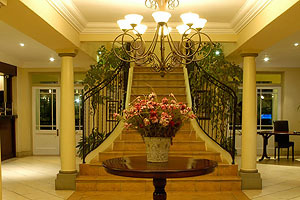 The Protea Hotel Dorpshuis & Spa Stellenbosch provides luxury accommodation and an excellent conference facility. All of the hotels 27 rooms are individually decorated and furnished with antiques. The ambiance is one a homely guesthouse with all the modern comforts and amenities you would expect from a 4 star hotel. Positioned in the historic town of Stellenbosch a short 40 minute drive from Cape Town and a mere 30 minute drive from the airport, the Protea Hotel Dorpshuis & Spa Stellenbosch offers conference delegates and business executives excellent views of the vineyards and beautiful mountains for their conference experience. 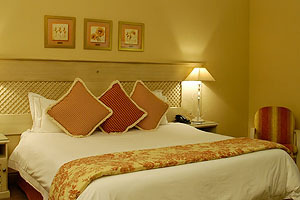 The 27 individually decorated rooms at the Protea Hotel Dorpshuis & Spa Stellenbosch are luxurious. 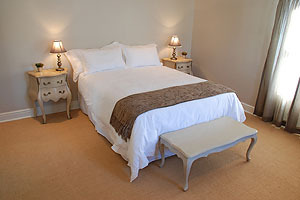 The spacious rooms boast twin or double beds a separate lounge as well as an own private patio. 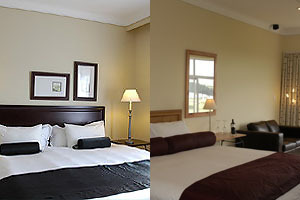 The Standard rooms contain all of the modern conveniences you would expect from a four star hotel. Uniquely furnished with antiques each room has its own distinctive character and individual look. The Deluxe loft apartments have either a single or King size bed and are well equipped. For the convenience of conference delegates and business executives the Protea Hotel Dorphius & Spa Stellenbosch South Africa provides a number of services and facilities. The lounge is furnished with original antiques and creating a classical ambience and quiet atmosphere ideal for conference delegates to relax and enjoy a drink in the evening. In the winter a log-fire nightcap in the deep sofas provides that perfect end to a busy conference day. The Dorpshuis offers the ideal setting for a spa.Conference delegates and busy business executives can revitalise body and soul with the exquisite pampering and rejuvenating facial and body treatments. The use of the sauna is complimentary with all treatments at the Dorpshuis Spa Stellenbosch South Africa. During the summer months conference delegates can start their day with an al fresco breakfast on the Vine-shaded patio or enjoy afternoon tea in this tranquil and relaxed atmosphere. The fully licensed Restaurant the “Oak-leaf” serves A la Carte Dinners as well as Set-Menu meals for conferences. The House specialty dishes include traditional South African fare such as Cape Malay Bobotie, and Venison dishes that will invigorate the palates of the most discerning patrons. Light meals are available throughout the day. 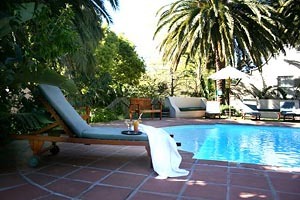 The sparkling swimming pool is heated and set in the tropical garden providing welcome relief from a hot summers day. The conferencing and banqueting facilities at the Protea Hotel Dorpshuis & Spa Stellenbosch South Africa are designed specifically to cater for an organisations requirements and budget. The conferencing venue can accommodate 50 conference delegates Cinema Style, 30 conference delegates Schoolroom Style 20 conference delegates U-shape and 50 persons cocktail style. 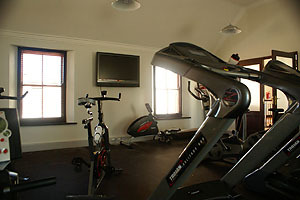 All of the audio-visual equipment can be obtained on request. The Protea Dorphuis outsources this function. 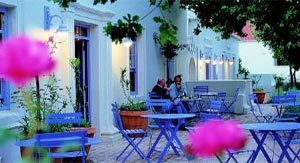 The Protea Hotel Stellenbosch Cape Town South Africa lies in the heart of the Winelands in one of the most attractive and heritage conscious towns in South Africa. 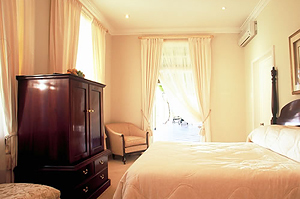 The 180 bedroom Protea Hotel Stellenbosch has a three star grading and offers excellent value. 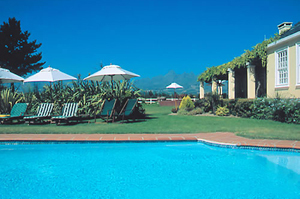 With a magnificent mountain range back drop and views over the neighbouring wine farms the hotel is excellently positioned for both business and leisure travellers. A 30 minute drive from Cape Town the Protea Hotel Stellenbosch South Africa is easily accessible and benefits from being positioned between two international golf courses and two superb wine farms. The Protea Hotel Stellenbosch South Africa is the largest conference venue in Stellenbosch offering a choice of 11 conferencing venues, including an open amphitheatre. Conference delegates and business executives visiting the Protea Hotel Stellenbosch are offered the choice of 4 Executive Rooms, 88 Deluxe Rooms and 88 Twin Bedded Rooms. All rooms have a view of the Blaauwklippen and Kleine Zalze wine estates, Table Mountain and False Bay, or Stellenbosch vineyards. The hotel’s 4 Executive Rooms have king sized beds full en-suite bathrooms with a separate shower and their own lounge area. The rooms have a mini kitchenette and are fitted with a plasma screen television. 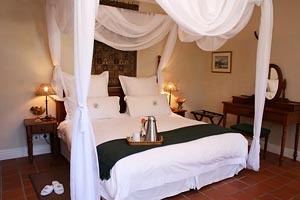 The Deluxe Rooms king size beds within the double bedroom can also be converted to 2 single beds. The lounge of the Deluxe Rooms can easily accommodate a third person sharing. The Deluxe Rooms have a kitchenette and separate lounge areas with TV and DVD and en-suite bathrooms including separate showers. The Twin rooms contain two beds en-suite with shower only. The King beds can These rooms can be booked as a family unit, which combines the Deluxe and Twin room to form an apartment, ideal for families and groups. Wireless internet access is available in all public areas, conference rooms, bedrooms and restaurants. For the convenience of conference delegates and business executives the Protea Hotel Stellenbosch South Africa provides a number of services and facilities. The Aristata Restaurant has a capacity for 220 conference delegates and guests offering traditional breakfast, light lunches and buffet dinners. A smoking section is available if required. The residents bar with a wonderful mountain back drop overlooking over-looking the Kleine Zalze vineyards and De Zalze golf course is wonderful way for a conference delegate to unwind after a busy day. If a conference delegate prefers something less formal there is the Black Bull Bar that has both outdoor and indoor seating and provides entertainment on most nights. Those conference delegates who are sporting enthusiasts the bar is a must as it is fitted with projection TV. The Braai (Barbecue for the International clients) and Pizza areas make a perfect way to round off a busy conference day. Room service available from both Aristata and Black Bull Restaurant. o Swimming pool with bathroom facilities overlooking vineyards. o Picnic and braai facilities. o Conference and Banqueting facilities. 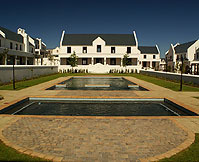 As biggest conference provider in the area the Protea Stellenbosch South Africa can offer a unique conference experience. The hotel’s conference service includes an all in one solution. This concept gives clients a venue, and the opportunity to create their own spectacular event, whatever it may be. A venue to suit all needs, all budgets!! The practical conferencing rooms, facilities provided and assistance from the Protea staff will ensure that the conference is successful. The Protea Hotel Stellenbosch South Africa conferencing venues can accommodate up to 700 conference delegates in 10 different conferencing venues. The ceiling height of 4.5m, adds significant height and volume to the conference rooms. The Magnifica Suite on the first floor can either be booked as one venue catering for up to 250 Banquet style, 400 Cinema and 250 Schoolroom. This conferencing venue can also be divided into 3 separate venues, accommodating up to 120 conference delegates in each. The second floor provides two conferencing venues, which can be booked as one venue, catering for up 160 Banquet style, 200 Cinema and 120 Schoolroom. This conferencing venue can also be divided into 2 separate venues. The Boardroom seating of 16 with a balcony overlooking the De Zalze and Blaauwklippen vineyards, is ideal for business meetings. The Aristata extension is another conferencing or banqueting venue for a maximum of 80 to 120 conference delegates. The Black Bull Restaurant is available for conference bookings during the day and can accommodate 30 conference delegates in a U-shape, 40 conference delegates in Schoolroom style and 50 conference delegates for Cinema-or Cocktail style. A dedicated Braai area with a spacious lawn makes this conference venue an ideal place for Team Building activities, picnics or a braai facility for a relaxing end of conferencing day. Tea and coffee can be served inside or outside (weather allowing). The natural light and fresh air flow within the conferencing venues makes the conference rooms great for any training, conference or seminar. An internet station with computers is available for conference delegates to use, in addition to the whole venue being equipped with Wireless Technology (WIFI). 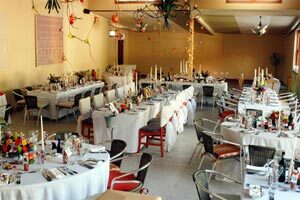 An audio visual specialist contracted to the Protea Hotel Stellenbosch will match your conference needs. 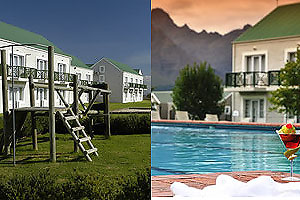 The Protea Stellenbosch also has an outsourced Team Building Company who can assist with various activities on the property, indoors and outdoors. All of conference venues enjoy natural lighting, 100% blackout lined curtains and the state of the art equipment modern day conferences require. Ample parking for non-resident conference delegates is provided. Bartholomeus Klip Cape Winelands South Africa is a 100 year old Victorian farmstead that lies on a large wheat and sheep farm with its own 10,000 acre private nature reserve.The main homestead achieves a lovely mixture of old and new using designer fabrics and antiques furnishings whilst still providing modern day comforts such as air conditioning. Bartholomeus Klip Farmhouse is a luxurious boutique hotel situated on a private nature reserve at the foot of the Elandskloof Mountains, just over an hour’s drive from Cape Town. Delegates can picture themselves sipping a cocktail from a deck overlooking a tranquil dam, where geese are your discreet visitors and trout swim freely in the cool waters. Then step into the Deckhouse for your conference. With doors flung wide open you will be able to savour the scents of the nearby forest and hear the gentle noises of the farm animals in the background, as you get down to business. Each of the four bedrooms at Bartholomeus Klip Cape Winelands South Africa have their own distinctive style specially made bed linen and generous reading lamps. Three of the rooms offer double or twin bed options. There is a separate suite known as the Orchid suite that was converted from the farm outbuildings and is both spacious and inviting. There is a private veranda where a conference delegate can imagine themselves in the African heartland. 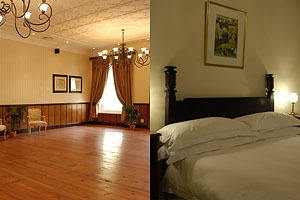 The rooms are all en-suite and are fitted with replica Victorian baths and basins. Each of the rooms are supplied with Bartholomeus Klip unique toiletries scented with fynbos and herbs. 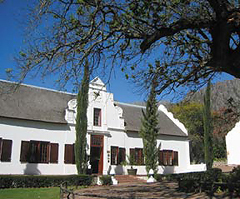 As well as the wonderful scenery Bartholomeus Klip offers a culinary delight and will certainly be one of the conference delegate highlights of their stay. 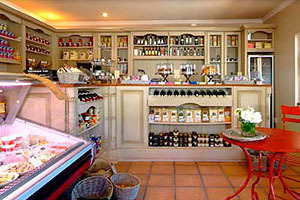 The food is in French tradition but with an emphasis on local flavour. The skilled and dedicated chefs have ensured as many as possible of the ingredients they use come from the local area, such as the locally-produced trout salmon and lamb, and the menus are always varied and imaginative. 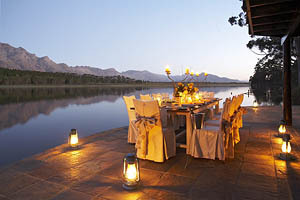 Bartholomeus Klip also provides mountain bikes and game drives for guests to discover the reserve or conference delegates can take to the water participating in canoeing, windsurfing or trout fishing. Imagine sipping a cool, well-deserved drink while you wind down in the open boma adjacent to the conference room, accompanied by the sound of water lapping softly at your feet. Not only does Bartholomeus Klip provide the ultimate venue, but as they are members of the Good Cooks Association, they fortify the body, mind and soul with glorious food that will tantalise the conference delegates taste buds and prepare their brains for the business at hand. Bartholomeus Klip is the perfect environment where you can be at your creative best. The facilities allow small groups of up to 30 conference delegates on a day package or 16 staying delegates to participate in conferences and other focused corporate functions. 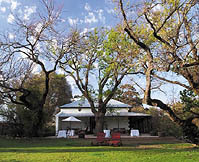 Conference events are held at the Deckhouse, a building separate from the farmhouse on the edge of the extensive farm dam, affording complete privacy to the delegates. The Deckhouse includes an air-conditioned conference room and an upstairs breakaway room with majestic views over the spreading sheet of water towards the mountain backdrop. All the normal conference aids such as projectors, whiteboards and flipcharts are already in place and additional extras such as notepads, pens, bottled water and mints can be arranged. Gourmet brunch and lunch are provided in the main farmhouse, and tea, coffee, juices and pastries are served at the afternoon break. 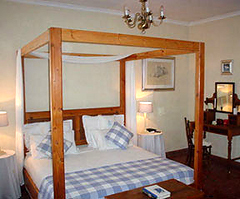 Straightway Head Country Hotel Somerset West South Africa is a short 30 minute drive from Cape Town. Tucked within the Helderberg mountains above Somerset West this country hotel enjoys magnificent landscaped views and is unique in character. This luxurious four star hotel is a place of tranquillity and is a flexible venue for both conference visitors and leisure guests alike. Conference delegates and business executives staying at the Straightway Head Country Hotel Somerset West South Africa are offered 18 suites consisting of 14 Classic Suites,3 Luxury Suites, I Honeymoon Suite plus a cottage for families. Tastefully furnished the suites are provided with en-suite and enjoy private patio areas that lead onto the rolling gardens. Straightway Head Country Hotel Somerset West South Africa provides the highest quality of cuisine at there a la carte restaurant Straightway. Conference delegates will enjoy the mingling aromas of new-world and traditional cooking or can choose a light meal on the large veranda overlooking the scenic grounds. In the evening guests can retire to the Spooks Hill cocktail bar for a quiet drink. 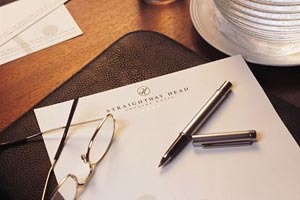 The Straightway Head Country Hotel Somerset West South Africa offers conference facilities carefully designed to meet an organisations every need. The air conditioned conference venue is spacious, peaceful and well equipped. Ideal for conferences product launches promotions and business meetings the venue has a capacity for 30 conference delegates. 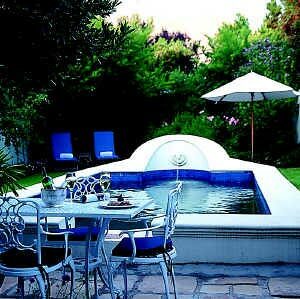 Lyngrove Guesthouse Stellenbosch Winelands South Africa is an enchanting house sited on a 80 hectare Estate in the famous wine region between Somerset West and Stellenbosch. This 5 star house is haven of peace and understated colonial luxury offering wonderful views over False Bay, the Helderberg Mountain range and of course the vineyards. Excellent private venue for a mini-conference or business meeting. 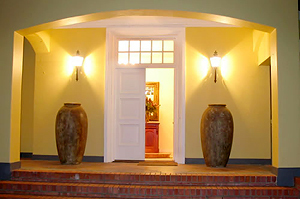 Lyngrove Guesthouse Stellenbosch South Africa has 9 spacious individually decorated rooms offering conference delegates and business executives the luxuries one would expect from a 5 star establishment. The nine rooms all enjoy spacious bathrooms and have climate control. 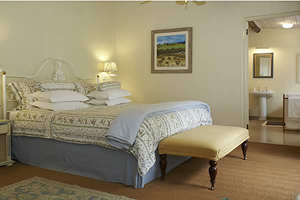 For the convenience of the guests Lyngrove Guesthouse Stellenbosch South Africa provides numerous facilities. Lyngrove Guesthouse Stellenbosch South Africa has a private executive board room facility for ten conference delegates.